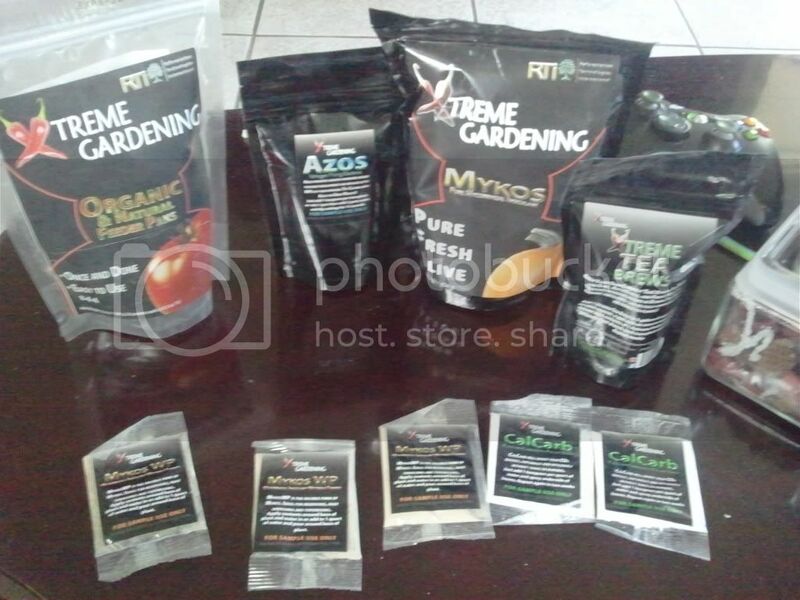 So today I got a surprice in the mail, I got a kit of Xtreme Gardening most of the things are just what I needed like Root Hormones by Microbes and it has tea brew kit also fertilizers and more stuff even with a huge Xtreme Gardening sticker lol, some stuff I don't know how to use but its a good way to start learning, besides I got all this for free!!! Allow me to help. This Sticky on Aerated Compost Tea will show you how, but be sure you're comfortable and up for a good read. Maybe just a few pages at a time...it's 34 pages long! Very detailed, very thorough, and very friendly/chatty! Yes, for the aerated compost tea (ACT) , you need a decent sized bucket, an airstone and an aquarium pump and probably some kind of filter. Since that sounds fairly complicated to me, what with having to time the brew and clean/ sterilize the equipment when you are done, I make a compost infusion instead: put a shovel of compost in a bucket, add rain water (or tap water that has sat over night, or water from the pond - just not chlorinated), add a glug of molasses, and stir with a paint stirrer. I keep stirring it every few minutes for an hour or so to give the microbes a chance to get going. I'm sure it doesn't end up as microbe-rich as real ACT, but it's good stuff and great for being able to spread compost around more of my garden. I really like the products that Xtreme Gardening sells. I use the Azos for cloning my tomatoes it works great. I also use there mycos and calcarb great products. I would recommend them. Did this organic fertilizer produce good results? Was it worth the cost of ordering it? I don't want to spend money on organic fertilizer gimmicks unless they truly work. I hope you post some pictures of your garden this year. Their products are really expensive... Is it really worth it? I was thinking of getting one bag of the beneficial fungi and another of the beneficial bacteria but only if it will make a big enough difference. I did see better prices on ebay but still very expensive!! rainbowgardener wrote: Yes, for the aerated compost tea (ACT) , you need a decent sized bucket, an airstone and an aquarium pump and probably some kind of filter. With your method do you use it right away? I use it from the time I start my plants till I transplant it has made huge differences in my garden. in new beds wow it really helps mycorrhazal fungi and adding rock dust to my gardens has had a dramatically helped my garden less water stronger plants less diseases. Would just the 6oz bag of Azos be enough for a home garden? I don't know how much you use and I need to order online since no one around here carries it.